CreditMarvel.com is dedicated to providing the very best credit repair company reviews anywhere. We do this by using a quantitative ranking method to determine our scores for each credit repair company that we review. When it comes to something as delicate as your personal finances, it is essential to have a clear overview of what you will be receiving for your time and money. Each credit repair company that we recommend will have SOME type of value or edge over their competitors. Our job is to provide you with an unbiased look at each company’s strengths and weaknesses so that you can make the best decision for you and your family’s future. Here is a list of the different metrics we use in our ranking strategy along with the ranking weight for each. Every credit repair company will have a few variations in what they offer as part of their overall service package. For example, Lexington Law offers XYZ, while Sky Blue Credit does not. The features that are offered should be aligned with your personal needs and should be comprehensive during the restoration process. We gave this metric a weight of 90% to ensure that all of the features and services that you need are available to you. We’re sure that you can agree that the benefits received from a credit repair company is paramount in your decision making process. This is exactly why the “benefits” metric in our ranking system carries a weight of 100%. We MUST ensure that the company you choose meets or exceeds your expectations. Press 9 to hear a menu of options….just kidding! No one wants to add any more frustration to their lives, which is exactly why we gave ‘Customer Service’ a weight of 80%. You need to get clear and concise answers as easily as possible. Any company that makes your life more difficult will have their overall review score dragged down. It’s likely that money is already tight if you’re on the hunt for a credit repair company. This makes it essential that you get the best bang for your buck. We only review companies that provide significant value to their clients. For this reason, pricing is a major component in our overall ranking strategy. This metric carries the lowest weight. This is because we believe that you should never get to a point where you have to call upon a company’s guarantee in the first place. We have been to the trenches and have emerged with a handful of restoration companies that stand behind their word. Of course, it’s important to have a safety net – which is why we gave our “guarantees” metric a weight of 60%. Planet Earth has become social! We look to our peers for advice and recommendations in every facet of life these days. The feedback that the Better Business Bureau provides is invaluable and absolutely needs to be accounted for in our reviews. It carries a weight of 70% in our ranking system. There isn’t any doubt that repairing your credit is a process that consists of several baby steps. We weigh the speed and reliability of each company at 80%. There should be no reason to lengthen the process at all. Credit repair clients should feel confident that they are getting exactly what they are paying for in a timely manner. Each company will receive a score on a scale of 1 to 10 for each metric listed above. We then multiple the score the company received for each metric by the metrics weight. The score for each metric is then added together to reach an overall score. We then compute the best overall score that is achievable based on our weight system. The company’s overall score is then divided by the best overall score and multiplied by 100 to get to their final review rating. 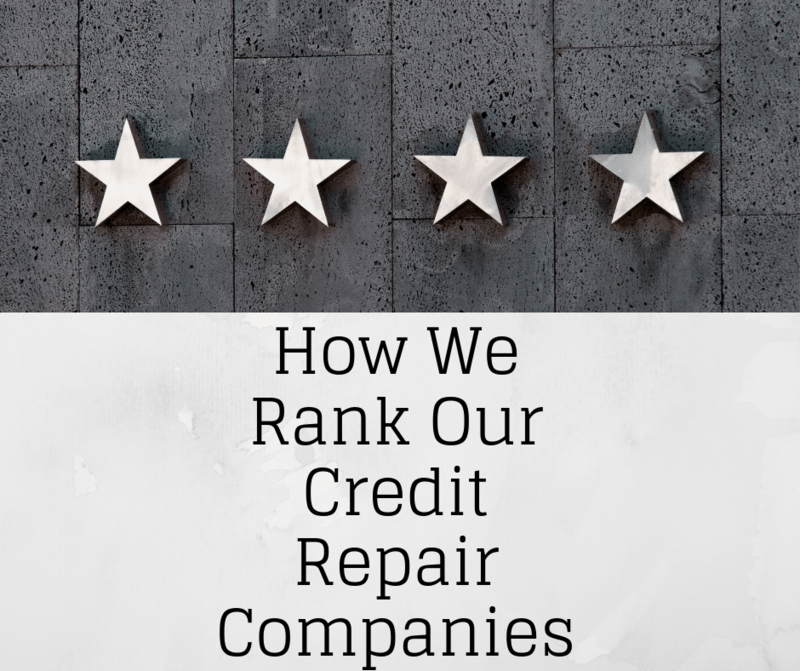 Did we miss anything that you feel is a major component to accurately ranking these credit repair companies? Let us know by contacting us here!